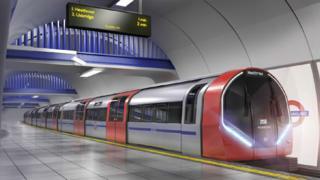 An East Yorkshire factory has won a £1.5bn contract to build new Tube trains for London Underground. Transport for London (TfL) said the 94 trains will be designed and built by Siemens Mobility at its planned £200m facility in Goole. The new trains are expected to start running on the Piccadilly Line from 2023. Siemens Mobility's chief executive Sabrina Soussan said she was "thrilled by today's announcement". The order is the first part of a plan by TfL to upgrade its deep Tube lines. The trains will replace existing stock that was introduced in 1975. The trains will be 20 feet (6m) longer than current ones and will have fully air-conditioned carriages and improved accessibility. TfL said the new Inspiro trains and improved signalling would allow it to run more services at peak times and carry an additional 21,000 passengers per hour. The Siemens contract is the first step in upgrading London Underground's four deep Tube lines, with improvements to the Bakerloo, Central, and Waterloo and City lines to follow. TfL said it expected "a single manufacturer building the trains for all four Deep Tube lines". Work has yet to start on the new train factory, which is planned for a 67-acre site close to the M62. When it opens it will employ 700 people.